Many professed Christians – and even many true Christians – hold a false doctrine of assurance. Often it is because the person who witnessed to them told them that all they had to do was make a profession of faith, walk an aisle, raise a hand, say a prayer, and never doubt what the Lord had done in their lives. Perhaps they have been taught that to ever doubt their salvation is to doubt God’s Word and integrity. Unfortunately, many evangelists, pastors, and personal workers attempt to certify a person’s salvation apart from the convicting work of the Holy Spirit and the evidence of fruit with continuance in obedience to the Word (John 8:31). But we have no right to assure a person of something we cannot be certain is true. God’s own Holy Spirit will witness His reality to those who truly belong to Him (Rom. 8:14-16). Peter makes clear that one’s calling and choosing are made secure by increasing qualities of fruitfulness that demonstrate the genuineness of salvation and eliminate stumbling over doubt (2 Pet. 1:3-11). And our Lord teaches that some people appear saved, but are not (see Matt. 13: 20-21). Quick and easy assurance can deceive. 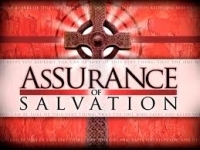 If you struggle with the assurance of your salvation, doubting your conversion to Christ, the following resources are sure to be a help to you.